Would you like to learn how to repair all kinds of small vehicles and machinery? This program consists of three levels; Basic, Intermediate and Advanced + (Master Service Technician). The course will cover the fundamentals of all four cycle engine operation, hands-on training in performing complete overhauls of four stroke L-heads and OHV engines (Briggs & Stratton) including diagnostics and failure analysis. 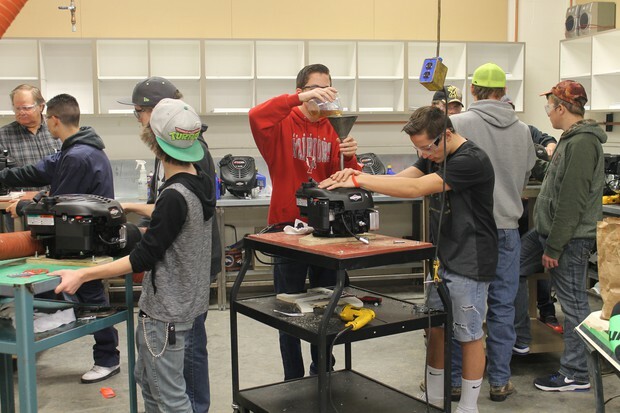 Students will also learn major repair of frame and suspension components and general repair of most small engines including lawn mowers, chain saws, water vehicles, motorcycles and ATV's. All students will receive a Briggs and Stratton technician account and access to Briggs and Stratton Power Portal. Students who demonstrate proficiency in the above will be invited to join Career Center's "Formula High School-Race to Learn". Fall 2017 Newsletter - Click Here! !